Fate/Grand Order is an RPG for Android and iOS platforms which lets players take on the role of a fledgling master on a quest to save time and space. It’s great fun, but with a few prerequisites. Fate/stay night is a visual novel about a mystic battle with legendary heroes from across time for a Holy Grail. The game debuted in 2004 and thanks to its popularity has gone on to spawn sequels, manga and novels, a few anime series, and a new mobile game. The story of Fate/Grand Order takes place in a distant future where you play the part of a young candidate in a research facility aimed at preserving humanity and that has developed a time travel technology that allows them to send people to various points in time. After an accident kills almost every other candidate, you are caught in the facility’s time travel device and sent to the Japanese city of Fuyuki in 2004. Right off the bat, the game has a bit of an entry hurdle in that if you are unfamiliar with the Fate series, there are a lot of concepts and terms that, while the game does make a bit of an effort to explain, will be for the most part alien to newcomers. There are also several characters whose mere presence in the game is a spoiler for previously released games in the series. However, the hurdle isn’t insanely high for a dedicated otaku and watching a couple of pretty damn decent series should set you up with the necessary lore. The game is labeled as an RPG, but it’s essentially an RPG in the way Final Fantasy Record Keeper or Mobius Final Fantasy are RPGs—i.e., lots and lots of combat. However, unlike the previously mentioned games, Fate/Grand Order is based on a property that started out as a visual novel, so there is a strong emphasis on story and plot development. In between battles, there are event scenes that can range in length from brief quips between characters to lengthy conversations with massive amounts of text. The game is also currently only available in Japanese so unless you understand enough to be able to navigate a fully Japanese visual novel, you may be in for an uphill battle. While story is important, the meat of the game is the combat, and that’s where the game shines. Players create a deck of up to five servants with two serving as the main combat team and three in reserve. For a third member in your main combat team, you can select from friends or other random players—most of whom, at the initial stages of the game, will have servants frustratingly far more powerful than yours. In combat, you are given a selection of five random command cards to choose from. The cards determine which character will attack and what kind of attack they will do. There are three kinds of attacks: Buster, Quick, and Arts. Buster is you aggressive attack that will do extra damage. Quick attacks are weaker, but drop critical stars which increase the chances for a critical hit the next turn. Arts is a normal attack that fills a servant’s Noble Phantasm (NP) gauge. When a servant’s NP gauge reaches 100% or more, they can execute powerful attacks that have various added effects. Selecting three of a kind of command gives an added bonus to whatever kind of command was selected. Selecting three commands all with the same character on them will give that character an extra attack. Characters also have skills that can be used for beneficial effects as well as your own skills that can be used to aid your servants. One of the biggest draws of the game are the various servants—famous, notorious, and infamous heroes from throughout time, assigned one of seven classes (although there are some exceptions). From characters from the original game like Hercules and Kojiro Sasaki, to original characters, part of the fun is seeing what historical figures will be assigned what classes, how powerful they are, and how they have been reimagined/redesigned for the game. One somewhat difficult aspect of the game is that your servants do not gain experience from battles. Rather, you can obtain experience cards through various means that are used to level up your servants. What this means is that the servant you use all the time may not necessarily be the one that gets stronger. This somewhat manual method of leveling can seem a little awkward at first, but once you get used to it, it opens up another level of strategy in what daily side missions to pursue and also allow you to level up weaker servants you want to use later. Currently, there are only three story chapters available—the 2004 prologue, the first chapter that takes place in the year 1431 A.D. in France, and the second chapter that takes place in the year 60 A.D. Rome—with more on the way. While it may not seem like much, considering the hefty amount of story dialogue, there is quite a lot to get through before you will run out of story missions. I started the game back in late August and I’ve only recently cleared the second chapter. Aside from the story, there are individual servant missions and daily missions, some of which require fairly high level servants to clear, which means a lot of leveling is necessary. Plus, you never know when you may get a servant that strikes your fancy that you’ll want to level up to have in your main combat team. The game is free to play, which means there are payable elements. There are two tiers of summons, the second has a chance of drawing the really rare and powerful servants, but requires gems that you obtain at a very slow pace. There is also a stamina bar that limits how much you can play in a single sitting. It’s annoying, but that is essentially the price one pays for a freemium game. From light-hearted but tactical gameplay to a story that is an entertaining romp in the Fate/stay night world, Fate/Grand Order sits in a rather peculiar spot in between your casual, time-killing kind of game and a solid engaging time-investment. It is definitely a game for fans. The combat is enjoyable but will probably be monotonous to people unfamiliar with the Fate series, while fans probably won’t be able to get enough of using their favorite servants to unleash cans of whoopass against enemies with their Noble Phantasms. While there is a hurdle for entry, if you’re willing to take the entry course or are already a fan, Fate/Grand Order is an enjoyable expansive chapter to the Fate world. 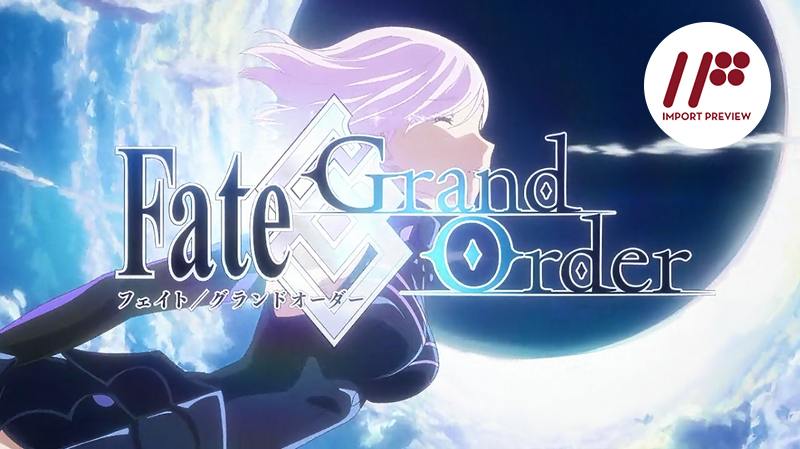 Fate/Grand Order is currently available for iOS and Android platforms in Japanese. The is currently no word on an English version.